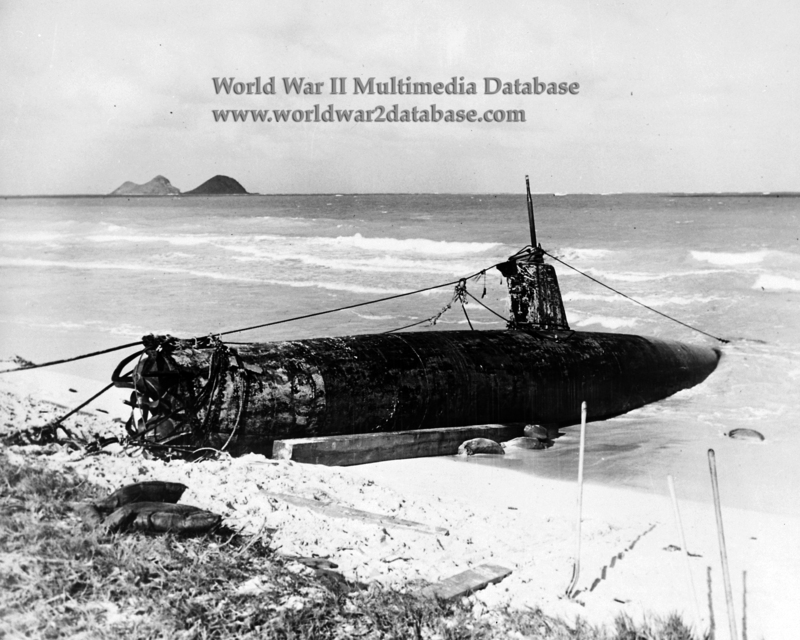 HA-19, a Ko-hyoteki ("Type A Target") class midget submarine, pulled ashore near Bellows Field. To the left are the sub's two Type 97 2,161 pound (980 kilogram) torpedoes; note wire attached to conning tower to push nets out of the way. HA-19 was built at Kure Naval Shipyard in 1938. For the Pearl Harbor attack, she was piloted and commanded by Ensign Kazuo Sakamaki (November 8, 1918 - November 29, 1999) and her other crewman was Petty Officer Second Class (or Chief Warrant Officer) Kiyoshi Inagaki (1915 - December 8, 1941). HA-19 suffered from a faulty gyrocompass that Sakamaki and Inagaki labored to repair at sea aboard IJN I-24, her mothership, since leaving Kamegakubi Naval Proving Ground near Hiroshima on November 18, 1941. At 0333 Hours on December 7, Sakamaki and Inagaki launched HA-19 10.5 miles (16.8 kilometers) west-southwest of Pearl Harbor. Sakamaki navigated with a magnetic compass, which was affected by the boat's electrical systems. By 0700 he had reached the entrance to Pearl Harbor, but he was depth charged by USS Ward (DD-139) which had already sunk one midget sub. HA-19 hung up on a reef, damaging one of her two torpedoes. At 0800 Hours she came under fire from USS Helm (DD-388) which blasted HA-19 off the reef. Sakamaki passed out, and the sub leaked, causing caustic gas to fill the sub. Plus, the seawater and the batteries combined to give the flooding an unpleasant electrical charge. After Sakamaki recovers, he sees Pearl Harbor burning, invigorating the crew. HA-19 again heads for Pearl Harbor, but is hung up on reefs again. Sakamaki and Inagaki move the lead ballast to the back of the submarine, and after a few hours HA-19 comes off the reef. Both torpedoes are out of commission and Sakamaki, desperate, plans to ram the USS Pennsylvania, his designated target. However HA-19, on the surface with her top hatch open, will not answer her helm and Sakamaki, exhausted, passes out again. Awaking around midnight of December 7/8, he decides to make for the rendezvous with I-24 near Lanai. Steering by magnetic compass, instead by the morning of December 8 he is off Waimanalo Point near Bellows Field. HA-19's batteries are dead after a day of maneuvering. Sakamaki attempts to beach but is again hung up on a reef. He and Inagaki abandon ship after setting demolition fuses. Meanwhile, Bellows has sent up aircraft of the 86th Observation Squadron, which spots HA-19 at the end of the runway. Lieutenant Paul S. Plybon, Executive Officer of "G" Company, 298th Infantry, and Corporal David M. Akui (January 16, 1920-September 15, 1987) approached the submarine. Akui took Sakamaki prisoner; Inagaki's body washed ashore the next day. Among the articles found in the sub were dried fish, apples, canned goods, American pencils, and one bottle of American Wilkens Family Brand Whiskey. The 86th Observation Squadron had a huge raft, seen under the sub, constructed of heavy lumber with empty 50-gallon drums as flotation gear. It was usually anchored out by the reef for swimming and other activities. That day, however, it was up on the shore for maintenance. Practically everyone in the squadron donned swimming trunks and helped launch the raft, after first affixing a steel cable to it. They pushed it out to the reef, fastened the cable to the submarine's nose area, then attached the other end of the long cable to a huge bulldozer used for construction work at Bellows. The bulldozer then reeled in the cable on the drum attached to it and just dragged the midget sub right off the reef and up onto the beach. It was only later that concern was given to the scuttling charge or the two torpedoes, which were still capable of exploding. They were inactivated. The radio was removed and floated to shore on a life preserver. A Navy technical intelligence unit from Pearl Harbor arrived with an 18-wheel flatbed trailer and hauled away the sub. It was later refurbished for temporary display in Hawaii before being shipped to the mainland. There it was hauled all across America with fake tin covers as torpedoes. It attracted crowds of people, received sensationalized press coverage, and motivated American citizens and school children to buy War Bonds and Stamps.